Gathering research is important for any project. I am now focusing my interests on Crowdfunding, specifically film crowdfunding campaigns. Howkins, J. (2002) The creative economy: How people make money from ideas. London: Penguin Global. Mingant, N., Tirtaine, C. and Augros, J. (eds.) (2015) Film marketing into the Twenty-First century. London, United Kingdom: BFI Publishing. Marom, D., Swart, R. and Grell, K.B. (2015) Crowdfunding: The corporate era. United Kingdom: Elliott & Thompson. Trigonis, J.T. (2013) Crowdfunding for filmmakers: The way to a successful film campaign. New York, NY, United States: Michael Wiese Productions. From these books I hope to get a general feel of the current market and common aspects that effect peoples efforts. I hope that they will also give me a more fixed direction to further my research and project. So far I am highlighting key phrases and words that help me to understand the current economic climate and where crowdfunding fits. Author LittlemisssimmsePosted on October 25, 2016 November 1, 2016 Categories Creative Futures MALeave a comment on Research Research Research! On Wednesday 19th October I attended a talk about using social media in business marketing by Philip Oakley who works for OutServeWeb. Oakley used 10 main points to help business utilise social media to market their business to the correct audience. As well as using local and international companies to compare with such as Staffordshire Oatcakes and Lego. After attending previous social media talks by other experts, I can safely say Oakley’s was one of the most engaging and understandable. We were engaged on a level that everyone could understand as small business. We were shown how to get our customers and fans to promote us for free. Examples such as Amazon Kindle who held a competition for a Kindle Champion where entrants had a number of tasks to complete each month, usually involving sharing a post about a book they read on the Kindle. Lego also encourage there fans to get involved by developing their own products. It a design gets enough votes the product will be made and sold. The design would also receive 1% of the profit made from the item. These are simple ways to make your business interactive and using social media to do this and secure a further reach. Oakley also suggested some helpful social media search sites and identifying your tweets engagement such as Social Searcher and Hashtracking. I decided to use Social Searcher myself as it was a free software. I began by entering my twitter user name and gained some interesting results. Using this software I will be able to monitor my social media impact or hashtag campaigns and adjust the way I communicate with my audience. Social Searcher can go into more detail too, showing when a campaign is most active or the audience reached. It is also bale to show if you have done positive or negative posts. Obviously this may not be completely accurate but i can give a user a better sense of their audience. Social Searcher can also identify key words used in your posts, again helping you to monitor individual campaigns. This is an invaluable tool that I will be using from now on. Unfortunately due to pricing I have not yet used Hashtracking.com and would rather use the trial during a campaign or project. I did however investigate other platforms to monitor social media such as Tweetdeck created by twitter to monitor your posts. This is a very helpful tool if you have multiple accounts for products, services, films, companies or individual profiles. It has allowed me to check the progress of my own account, my company and the feature film project. This is especially helpful if multiple people use the account. Dr David Heap has been our guest lecture for the past 3 weeks discussing Research. At first the thought of 4 lectures based entirely on research importance baffled me. I’d been doing this throughout my higher education and thought it had been drilled into us enough. However, Dr Heap showed us how to look at it differently compared to how I had previously been taught. This week particularly made me think about how I’d previously gathered my research and scrutinised it. However, it wasn’t this that I was mostly interested in. What got me thinking was the section about ‘what to look for in your findings’ and critical thinking. The dictionary describes ‘Critical Thinking’ as the objective analysis and evaluation of an issue in order to form a judgement. We do it everyday in many situations without even realising it. But do we do it enough when it comes to things we read on the internet or what people directly say to us? When researching a project as students we are told to comment on the reliability of our sources but when it comes to socially looking at what we are told, I don’t believe we do enough. A prime example of what came to my mind was the ‘Avril Lavigne Conspiracy’. In short, a Brazilian blogger was investigating how easy it was to make people believe something over the internet by forging facts and figures and created the ‘Avril Lavigne is Dead’ blog. They story spread across the internet and soon people were rally believing that Avril had been replaced by a doppelganger. The story got so big it was reported in a number of British newspapers including ‘The Sun’ (28/09/16) . I noticed the story first when it popped up on my Facebook newsfeed and instantly rolled my eyes thinking that no one would buy in to it. However, the next day I found that it had been shared by three more friends. After reading through a few comments I realised that people were really considering that the singer was dead. Curious I decided to have a look at the original source. A number of photos were displayed to prove the theory. “Esse blog foi uma forma de mostrar como teorias da conspiração podem parecer verdadeiras. In a age where information is constantly available and in our view we now more than ever need to check our sources and to not believe everything we read. Dr Heap’s ‘Triangle of Truth’ is a simple way of analysing things? By viewing things from more that one source and with a number of different data sets, you get as close to the ‘truth’ as possible. For a project to be successful the organiser must create a plan. As part of my masters we discussed the use of Gantt Charts, Blueprints and tools to manage your time. If you are unable to manage your time, you will be unlikely to complete the vent or project you have set out to do (or you will have a very unnecessary stressful time). This gave me basis of what needed to go in my gantt chart. I then finished my numbering the order I thought they needed to start. Next came the hard part, placing my data on to a gantt chart using excel. I am usually quite technically minded but I struggled with this aspect. Once the information began to appear I also realised my dates were possibly wrong and alot of what I had planned academically now affected my extra-curricular activities. Reshuffling the information, I was able to complete my first ever gantt chart. Surprisingly I stuck to this quite carefully and did find it helped manage my time (although I still found it difficult to initially make). It also helped when things didn’t go as planned. Unfortunately during the 2nd semester I had my appendix out but the gantt chart allowed me to move items about and review my time more easily (once I was back on my feet). I was able to account for everything I had left to do and what could be pushed back. It also let me reflect on the information I was gathering and creating. Was there anything I could leave out? Or was it completely necessary to the project to do this? The other benefit with the gantt chant was that it was easier to discuss with my mentor where I was and what I needed to do. I didn’t need to display a messy list of items but could show them clearly and visibly. It did however make it glaringly obvious when I was behind but it’s important to not let the panic set in. The chart is designed only for you to manage your time and it’s perfectly okay to be behind just as long as you motivate yourself to complete the work. The post it note challenge allowed us to display the same information in a more creative and visual way. Our class was split into three groups and each given a scenario with a start and finish. Put simply it was our job to fill in the blanks and timeline it. Commissioned to Create a Fashion Show in London using Four Designers. Congratulations on a Successful Event and Enjoy your Bubbly! Our group began by shouting out any and all ideas and sticking them on the wall. In hindsight this was probably not the best method as we soon didn’t know what was actually up there and what we had said. It also meant the board was being re-jiggled constantly (and battling the constantly escaping notes falling to the floor). When we had a large bulk of notes we stopped and went through from the beginning trying to identify what was missing and if there was anything at the end which required us to do something earlier, for instance we had stated ‘create goody bags’ but hadn’t identified where we would get the items or who would make them. It then allowed us to look at the information financially. Would we require sponsors or funding? Each item spanned it’s own question. Who would do this for us? Or would we be doing it ourselves? Group 2 and Group 3 both had different approaches too. Group 3 split the information into a beginning, middle and end. There post it notes looked similar to group 1 but with a straight line of information that needed to be done in the middle. Group 2 took a more technical approach and colour coded their post its into categories. This allowed them to focus on the main areas to complete their project, it was also visually easier for someone to understand and anyone could pick up the information. However, due to the limited time frame given to complete the task, meant that there were more aspects that could have been taken in to account if given more time. All these styles of planning could later be converted into a chart with added information included such as How long each task would take? Which tasks link together? Key items that MUST be completed for the project to move on? The challenge now is to do the same thing with our first projects! Crowdfunding has become a common term used daily in many specialised areas to fund small projects. A Crowdfunding campaign can be used to fund a project, product or service through public donations. This can allow a project that would have struggled to gain investors, to go directly to the public and develop a personalised connection. Crowdfunding is defined in the Oxford dictionary as ‘The practice of funding a project or venture by raising money from a large number of people who each contribute a relatively small amount, typically via the Internet’ (Oxford, 2016). Millard (2016) explains that although the term ‘Crowdfunding’ may be relatively new, the practice of lending and sponsoring each other is evident in the biblical age. “The idea of acquiring funding from an ‘alternative’ source is perhaps appealing to business founders because what we now recognise as the ‘sharing economy’ is not so new at all.” (Millard 2016). These practices have changed and developed with each culture and technological advancements. “Before computer-mediated crowdfunding, creators often engaged in personal crowdfunding initiatives. For example, musicians would publicly ask their fans to fund a new album or tour.” (Gerber, Hui, Kuo 2016). The development of the internet has allowed the movement of crowdfunding to be accessible to anyone and tailored to each individual project. It is also open to anyone with access to money and the internet. Grell, Marom and Swart (2015) describe the movement as ‘Empowering the Crowd’. They explain how crowdfunding was developed at a time of need, when professional investment was extremely hard to secure due to the previous financial crash so entrepreneurs decided instead to raise the funds from a larger source rather than one place. Freeman and Nutting (2015) explain in their paper ‘A Brief history of crowdfunding’ that the movement began gaining traction in the United States with Brian Camelio who launched ‘ArtistShare’ (2003). The website was designed to allow musicians to seek donations for their work. Donations over $250 were listed in the booklet accompanying the album, as people who “helped to make this recording possible”. Crowd Expert looked at a variety of sources to show the trends of the crowdfunding movement as it has developed from 2009 onwards. Chance Barnett a CEO of Crowdfunder.com is sourced in the article showing crowdfunding surpassing angel investing in 2015. Crowdfunding Platforms vary in the way donations can be made or projects are marketed. Rewards based models are more successful according to crowdfunder.com (2015) infographic while lending is the less preferred method. These models are important when choosing which platform to go with to suit a project. Crowdfunding is now branched out to the corporate sector. “It weaves crowdsourcing, open innovation and co-creation into a holistic framework for tapping into the resources and wisdom of the crowd.” (Grell, Marom, Swart 2015) Companies such as Coca-Cola and Honda who don’t need the funds have instead used crowdfunding to engage with their consumers and promote products. It is an opportunity to gain finance but also consumer investment by using it as a marketing tool alongside social media. It gives a more personalised connection with those donating and interacting with the product. The creative economy often relies on some form of crowd sourcing to start-up a project. Howkins (2013) states that crowdfunding was boosted in the United States when Barack Obama launched ‘Jumpstart our business start-up Act’ (JOBS) in 2012 as a way to improve the US economy. After crowdfunding (if successful) the next step would be to borrow from a bank for gain finacial investment from a corporation. So if you need to raise funds for a trip such as Jake’s Dream Trip to Florida, create a potato salad, make a film or build a wind farm, don’t forget to check out crowdfunding as a possible source of income. 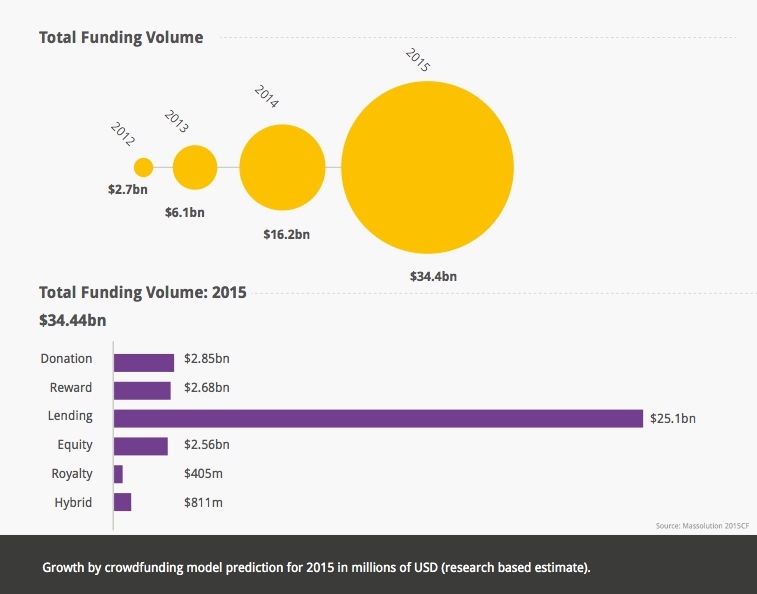 Barnett, C. (2015) Trends show Crowdfunding to surpass VC in 2016. Available at: http://www.forbes.com/sites/chancebarnett/2015/06/09/trends-show-crowdfunding-to-surpass-vc-in-2016/3/ (Accessed: 10/10/2016). Crowdfunder (2015) The History of Crowdfunding. Available at: https://www.crowdfunder.com/blog/wp-content/uploaded-files/History-of-Equity-Crowdfunding.pdf (Accessed: 10/10/2016). David M Freeman, Matthew R Nutting (2015) “Brief History of Crowdfunding”. Economics and Management: 2013. (Accessed 12.10.16). Drake, D. (2015) 2, 000 global Crowdfunding sites to choose from by 2016: Top 5 growth indicators. Available at: http://www.huffingtonpost.com/david-drake/2000-global-crowdfunding-_b_8365266.html (Accessed: 11/10/2016). Gerber, E., Hui, J. and Kuo, P.-Y. (2016) Crowdfunding: Why People Are Motivated to Post and Fund Projects on Crowdfunding Platforms. Available at: https://www.researchgate.net/profile/Pei_Yi_patricia_Kuo/publication/261359489_Crowdfunding_Why_People_are_Motivated_to_Post_and_Fund_Projects_on_Crowdfunding_Platforms/links/00463533f6db1c5c01000000.pdf (Accessed: 11/10/2016). Howkins, J. (2013) 2nd Edition. The creative economy: How people make money from ideas. London: Penguin Global. Pages 65 – 67. Marom, D., Swart, R. and Grell, K.B. (2015) Crowdfunding: The corporate era. United Kingdom: Elliott & Thompson. Pages 1-2. Millard, C. (2016) A RETURN TO OUR ROOTS: A BRIEF HISTORY OF CROWDFUNDING. Available at: https://fundwise.me/en/blog/return-our-roots-brief-history-crowdfunding (Accessed: 10/10.16). Author LittlemisssimmsePosted on October 11, 2016 December 12, 2016 Categories Creative Futures MA, Scribbles and ScrawlsLeave a comment on Crowdfunding…What is it? As part of my work this year I will be carrying on my business from the previous year. The previous year was a success with the business earning a small profit. Although there wasn’t much activity due to study commitments the business has remained up and running with bright things planned for the future. The main project is the completion of the feature film ‘Carney’ set during the 1980’s British mining strikes. The feature film has been scripted by myself and along with two other Staffordshire University master students, we hope to have the film released by Winter 2017. There’s a lot of work to do including designing a webpage to display all information about the business and ongoing projects. I chose WordPress due to the ability to link the site with my own blog and allow easy access. It also meant that I had a good sense of how to use it…or so I thought. WordPress is fortunate enough to have a team of developers constantly updating and improving the service, this however meant that I was a little out of touch with it’s use. The service also allows you to buy your own domain and URL for instance instead of wordpress.com I could use scribblesandscrawls.com. I intend to pay for this service at a later date however while the site is under construction I would prefer the page to be harder to find until its complete. I started with the basics by choosing a theme. This initially took a few tries before I was satisfied on a design that matched any previous artwork created and easily accessible by a user. I finally settle on ‘Suits’ as it gave the site a professional look. Changing details of areas and widgets was simple so I started with simple descriptions that can be changed at a later date if necessary. The front page I kept very plain while finishing the layout of the site with the intention of updating content further on. The next biggest challenge was working out how to add/adjust pages and update the menu bar. This took more figuring out than I’d like to admit but after reading a quick how-to-guide I slowly managed to get the hang of it. This allowed me to have key page areas such as a ‘Home’ page, ‘Feature Film’ Section and ‘About’ page etc. which would then divert users to other sections including the feature film Carney. This design makes it easier to add any later projects to the webpage without deleting old projects and keeps the layout simple and easy to navigate. On every page the user is also able to access social media sites to follow and gather more information. This function is great and keeps the audience connected with the work. From a marketing perspective this can also work backwards with specialised deals advertised on a particular platform or a code to a discount. Crowdfunding opportunities can be easily linked and found. I believe it is important to connect everything together for the ease of the user. This bar can be easily adjusted or updated so current news updates about the business or projects. It can also be used to advertise any information and direct users to new areas keeping the site interactive for those who want to know more. WordPress users can also easily follow the site and mark it as there favourites. Now that the layout is complete I am able to focus on the content for users to read. This will be complied using a number of sources. Focus will be given to a clear ‘Services’ page and updating the feature film information. It will be important to keep up-to-date. Especially with blog information as users will expect consistency. Once the site is functioning for a user I will be able to advertise it on social media platforms, email replies, film and services forums and to any other interested parties. The webpage will be designed to hold any and all information about ‘Scribbles and Scrawls’ and the projects it is undertaking so keep your eyes posted!